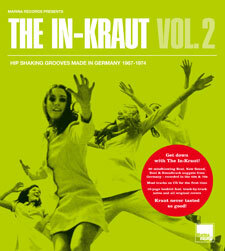 One of my favourite albums of last year was The In Kraut (Hip Shaking Grooves Made In Germany 1966-1974), which, as the title suggests, was a mix of latterly sampled grooves, lost gems and general weirdness from the German music scene of the 60s and 70s. Well, the good news is that the sequel is ready to hit the shelves under the title The In-Kraut Volume 2 (Hip Shaking Grooves Made In Germany 1967-1974). It’s described as "a deep trip into the funky musical spheres of 1960s and 1970s Germany – an undiscovered universe full of Hammond-heavy grooves, tight big band arrangements and fuzz guitar enhanced dancefloor nuggets". Interesting tracks this time include a big band take on Deep Purple’s "Black Night" from Hugo Strasser, Hazy Osterwald Jet Set’s "Swinging London", James Last getting funky with an obscure 60s b-side ("Soul March") and Krautrockers Can’s first-ever recording, the super-rare "Kamera Song". It’s out on October 30th, with a limited edition double vinyl edition pressed on white vinyl.